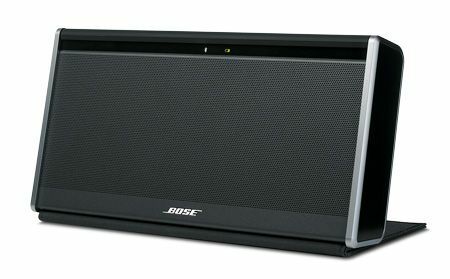 Bose Soundlink review | What Hi-Fi? This is something of a departure for Bose. It has previously produced speaker docks – and indeed incorporated Bluetooth technology into some of its products – but strictly speaker this isn't a 'dock' at all. The portability offered here, together with more than a nod towards style and a relatively accessible price tag, sees Bose making moves in a new market area. There’s no iPod dock here. This is simply a wireless speaker. Connecting easily to any Bluetooth-enabled device within 10 metres – smartphones (Android, iOS and more), tablets, laptops and computers – at the touch of a button. Sadly, there’s no sign of the superior APT-X Bluetooth codec. There is, though, a standard 3.5mm input on the back. A rechargeable battery ensures you’ll get around eight hours of life away from a power socket (there’s a full/medium/low battery indicator light, too). is smooth and there’s a satisfying feel to the buttons. An integrated cover folds down against the front of the speaker, turning it off and protecting it from the elements as it does so. In use, it folds behind the speaker to act as an stand. A choice of covers will add some colour for £25 or a premium leather finish for £50. It’s a covetable package. For a small, portable, wireless speaker, it doesn’t sound too shabby at all. Ryan Adams sounds natural and balanced, while Foo Fighters are given punch and drive. It does a good job of filling a decent space and goes fairly loud, even if bass notes sound a little one-dimensional. Wireless audio products at this price will always lose detail – it sounds better via the 3.5mm input – and the best iPod docks around do offer more sonically. There’s a premium to be paid for the portability, wireless streaming and, arguably, the Bose name, but solid build and equally solid sound makes it a premium worth considering should those key features be on your shortlist.